We hired a car in Cape Town from CABS car Hire to go see the snow in Ceres for the weekend. On the way there we stopped for lunch and some wine tasting at Waverley Hills Estate. 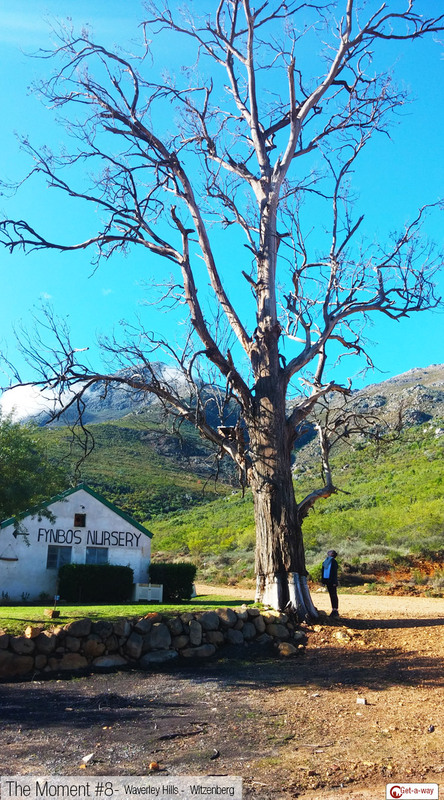 It’s situated between Tulbagh and Ceres, South Africa, at the foothills of the breathtaking Witzenberg Mountain Range. This area is renown for its diverse fynbos, that gives their wine a unique herbaceous character. Waverley Hills uses conservation and sustainable wine practices for which they have been awarded “Best Of Wine Tourism” winners. Cabernet Sauvignon, Merlot, Mourvedre, Shiraz, Viognier, Chardonnay, Sauvignon Blanc, Semillon, Pinot Grigio, Grenache Noir. The estates venue can host weddings and conferences with accommodation for small or large groups up to 120 people. The restaurant lunch was great but the free wine and olive tasting made our day. After our lunch we went for a short walk and ended up at the Fynbos nursery, which is where our perfect Moment – 08 came from. Waverley Hills Estate is having their Green Fair on the 5th September, starting off at 09:30 with a farm walk to raise money for CANSA. The fair has free entry with live music by Bottomless Coffee Band, indigenous plant inspired gourmet food and organic wine pairing, craft beer, local produce, fynbos plants, kiddies zone and a whole lot more! So take a 1.5hr drive out over the mountains from Cape Town and make the most of a day in the country.